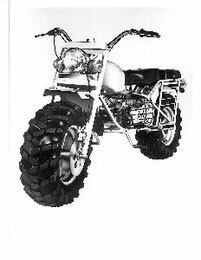 Some ROKON Motorcycle Manuals PDF are above the page. The most famous 2x2 motorcycle was produced in 1968. 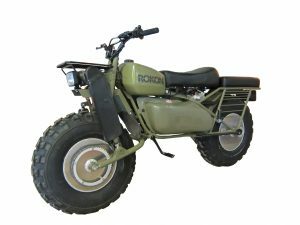 ROKON - so called this all-terrain vehicle - can be considered one of the most ingenious and successful inventions of the twentieth century. Not having undergone any significant constructive changes, ROKON has been successfully sold to this day. It motto is: "This is not a motorcycle, it's a two-wheeled tractor." The front wheel ROKON is driven by two chains, the rear wheel also has a classic chain drive. The problem of suspension has been solved radically - it is absent on ROKON, and wide tires-duffers have damping properties. They provide low ground pressure, allowing the motorcycle not to sink in liquid mud and not burrow into the sand. Designers managed to achieve extremely low weight of the motorcycle - less than 100 kg. Thanks to wide tires, low weight and constant full drive, ROKON is able to cope with almost any off-road capability. All-wheel drive is not the only technical feature of ROKON. For example, its wheel disks are made in the form of airtight drums and are capable of carrying an additional supply of water or fuel. Moreover, thanks to the "empty" disks and wide tires, the motorcycle has a positive buoyancy and can not drown! The ROKON is equipped with a virtually noiseless four-stroke engine with a capacity of 6.5 hp, which is quite enough for its weight. It has an automatic centrifugal clutch and three-speed gearbox. The driver immediately selects the desired driving mode, after which he operates only with gas and brake. The first transmission is reduced for especially difficult off-road conditions. The second is for unhurried maneuvering. The third mode allows you to accelerate to the maximum speed - it is 50 km / h.
ROKON - a unique vehicle that can drive anywhere, and in extreme cases it can be carried away. It is not for nothing that in 2001 the army of Jordan bought a batch of these cars. There're used Kohler and Honda (Manuals page) engines.